Trains provide public transportation to many towns and villages in the Lake Geneva region while fast railway links go to Paris (TGV Lyria) and other parts of Switzerland. Trains provide very useful transportation links in the Lake Geneva region. The main railway line is between Geneva and Lausanne with major railway links continuing past Lausanne to Bern and Biel (Bienne) and up the Rhone Valley to Brig. Local trains provide public transportation to many small towns. Further railway lines go from Lake Geneva to the mountains and popular tourist resorts. 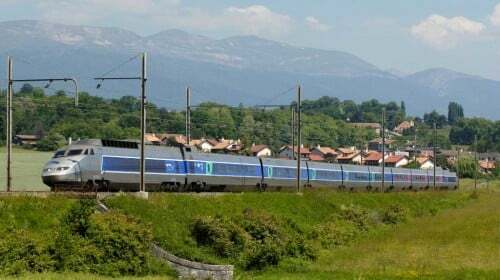 High-speed trains are available from Geneva and Lausanne to France and Italy. Railways and even bus links on the southern French shores of Lake Geneva are very limited. 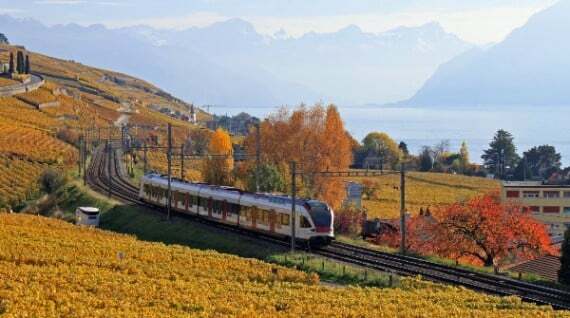 It is often easier to use the trains on the Swiss northern shores and cross the lake by ferry to reach towns such as Yvoire, Chen-sure-Léman, Thonon, and Evian. Timetables for all Swiss public transportation and the cheapest train tickets are available from Swiss Railways (SBB/CFF). Buy tickets before boarding trains, or expect a hefty fine. Similarly, if buying tickets on a mobile phone, the transaction must be completed before boarding the train – fines have been sent to purchasers who completed the transaction after the departure time of the train. The busiest railway link in the Lake Geneva region is between Lausanne and Geneva. Most Inter-City trains from Geneva start at Geneva Airport (GVA) before stopping at Genève-Cornavin (Geneva’s main train station) before proceeding along the northern shore of Lake Geneva towards Lausanne. Trains from Geneva to Lausanne take between 30 and 60 minutes. Usually around five or six trains per hour operate between these two Lac Léman cities. The travel time depends mostly on the number of stops rather than the type of train. The nonstop IR train is just as fast as the nonstop EC train. Euro-City (EC) trains usually go nonstop between Geneva and Lausanne and do not stop at Geneva Airport. Inter-City (IC) trains usually travel non-stop between Geneva and Lausanne IC1 and IC5 trains start at Geneva Airport and stop at Geneva main station but then follow different routes into German-speaking Switzerland with St Gallen usually the final destination. Only IC1 trains stop in Lausanne. If on an IC5 train, change for Lausanne in Morges. Inter-Regio (IR) trains between Geneva and Lausanne are sometimes nonstop but usually stop in Nyon and Morges. Regional-Express (RE) trains are the slowest and between Geneva Cornavin and Lausanne usually stop in Coppet, Nyon, Gland, Rolle, Allaman, Morges, and Renens VD with Vevey the final stop beyond Lausanne. IC1 travels via amongst others Lausanne, Bern and Zürich. IC5 trains travel via amongst others Morges, Yverdon-les-Bains, Neuchatel, Biel and Zurich. IC5 trains from Geneva do not stop in Lausanne – change trains in Morges – but some IC5 trains has Lausanne as departure station or final destinations and then do not stop in Morges or Geneva. From Lausanne, IR15 goes to Luzern with stops en route at amongst others Palézieux, Romont, Fribourg (Freiburg), and Bern. From Lausanne, IR90 trains continue up the Rhone Valley with stops at Vevey, Montreux, Aigle, Bex, St-Maurice, Martigny, Sion, Sierre, Leuk, Visp and Brig. Inter-Regio (IR) trains usually run twice per hour but not always stopping in all the smaller towns. TGV Lyria trains offer fast connections from Paris to Geneva (three hours) and Lausanne (3h41). Nine TGV Lyria trains run daily between Paris and Genève and four trains between Paris and Lausanne. During the summer vacation and winter ski season, some TGV Lyria trains continue past Lausanne up the Rhone Valley to Brig. SNCF TGV trains are also available from Geneva to especially southern France (including Marseille and Nice). The timetable depends on the season. Euro-City (EC) trains connect Geneva and Milan and Geneva and Venice in Italy via Lausanne, Montreux, Sion, and Brig. The Milan train runs three times per day with traveling time from Genève to Milano just less than four hours and to Venice daily in around 7 hours. 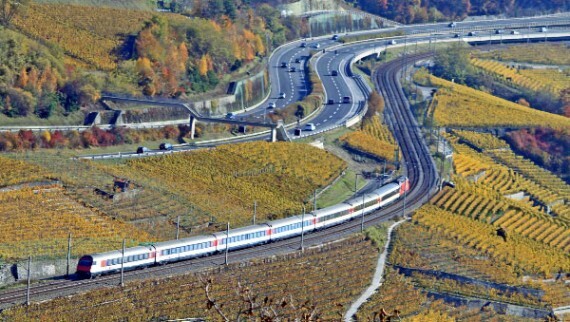 High-speed trains from Germany and Austria do not continue all the way to the Lake Geneva region. Easy transfers are usually required in Basel, Biel / Bienne, Bern, or Zurich. Geneva to Bellegarde (France) via La Plaine. Lancy-Pont-Rouge via Geneva to Versoix and Coppet. Several further trains operate in the Lake Geneva area and many are useful for tourists too. NSTCM train from Nyon to St Cergue and La Cure in the Jura Mountains. BAM train from Morges to Apples, Bière, and L’Isle. LEB trains from Lausanne to Echallens and Bercher. 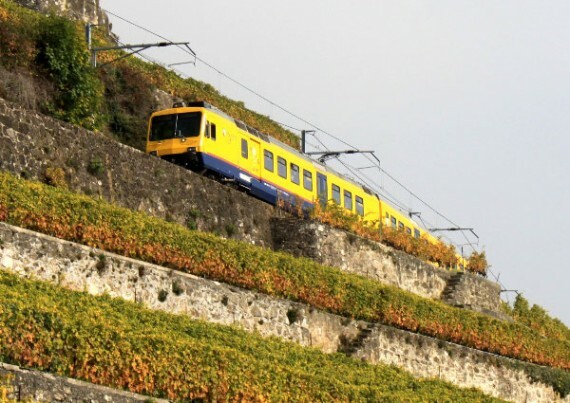 Vineyard train from Vevey through the vineyards of Lavaux to Chexbres and Puidoux-Chexbres. Funicular from Vevey to Mt Pèlerin. Train of the Stars – a rack railway from Vevey to Les Pléiades via Blonay. Golden Pass Line from Montreux to Gstaad, Zweisimmen and on to Interlaken and Lucern – one of Switzerland’s best-known scenic mountain railway journeys. The Chocolate Train from Montreux to Broc (near Bulle and Gruyères) with the Maison Cailler chocolate factory. Golden Pass rack railway from Montreux to Rocher-de-Naye. Several museum and special steam and historic trains also operate in the Lake Geneva region. Most run only during the summer season and on weekends. See also Transportation in the Lake Geneva Region for more on transportation options in the region including boats, driving, and flying. The Junior Card for very cheap travel for children 6 to 16. The Half-Fare Card for 50% off on most transportation tickets.